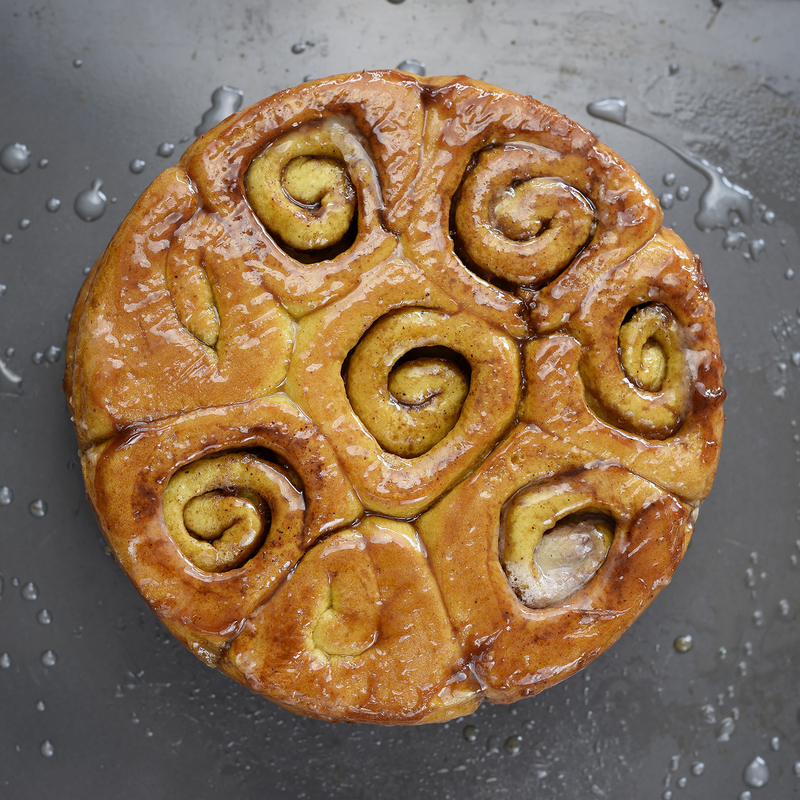 Cinnamon Sticky Buns. Sugar Glory. As you can see from the speed of my posts these days – I’m challenged to find time to share as often as I was in past months. I figure if I can only post once a week at most (for now!) then I might as well try to make it count, ya know? Things that are a little more labour intensive, more of a challenge for those of you who are actually trying these recipes for yourselves. I’m still adjusting to these 6 am wake up calls, so at the end of the day/week.. I’m a little beat. Years of starting work at 2 pm will force you out of the loop. It’s like an alternate world, seriously! The holidays are creeping up on everyone, we’re less than two weeks out. I’m trying to keep it simple these days, not spending exorbitant amounts of money on gifts that get mostly tossed to the wayside. Spending money isn’t the point of it all. If you happen to come across something perfectly suited to a loved one – great. But thinking of more meaningful things to do for one another is better than scrambling to buy, buy, buy something. This year I will offer things that are useful or meaningful rather than just finding something. Anybody thinking along the same lines? -Add the dissolved yeast and egg to the flour and knead with the dough hook for 30 seconds until starting to come together slightly, and at this stage add the other 2 TB of water to help it form together, and add the salt in small increments as the dough is kneading. -Continue kneading on low speed for 3-5 minutes until the dough is well formed. -Form the dough into a nice smooth surfaced ball, cover with damp towels or plastic wrap, and allow to sit in a warm place until the dough has approximately doubled in size. ** I turn on my oven to a low temperature and allow my doughs to rise in a bowl on top of the preheating oven, as this is a little quicker than just resting at room temperature. 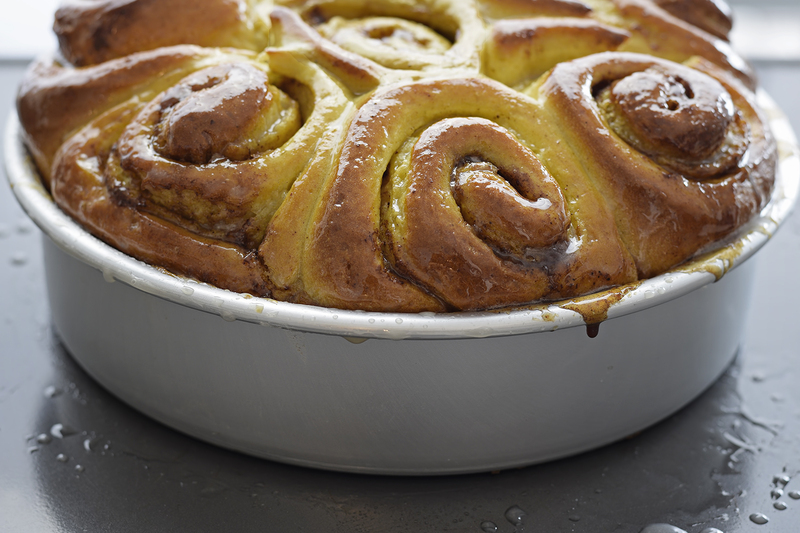 It’s best for flavour development of bread doughs to ‘slow rise’, sometimes overnight in the fridge even, but for something like cinnamon buns.. quicker is fine. You aren’t sacrificing anything much. For this recipe I’ve let the dough rise at room temperature for about 15 mins and then placed the dough in the fridge overnight. The dough was perfectly risen by the time I got up this morning! -Once the dough has risen to approximately double its original size: remove from the bowl and on a lightly floured surface roll the dough out into a rectangle about 16 inches long and maybe 6-8 inches high. -Mix together the cinnamon and brown sugar. Begin spreading the soft butter across the rectangle of dough with a butter knife until the entire surface has a nice thin coating. -Sprinkle the sugar and spice mix over the dough as evenly as possible, and then roll up the rectangle starting with the edge closest to you, rolling it upwards away from you. -You don’t want the log to be rolled too tightly or too loosely. Too loose and the rolls won’t slice nicely, too tightly and the rolls will bounce up and out in the centers once they’re baking. I fold the first edge of dough upwards twice, and then using the palms of my hands I roll the rest straight upwards away from me in one swoop. Hopefully that helps you! If you don’t have perfectly rolled buns the first time around – it’s no big deal, practice makes perfect anyways! -Once the log is formed prepare an 8 inch round cake pan with parchment paper, butter/flour, etc.. preheat your oven to 365 F, and begin slicing the log into buns. -Make the first slice directly in the center of the log, then cut each of the halves directly in the center as well. 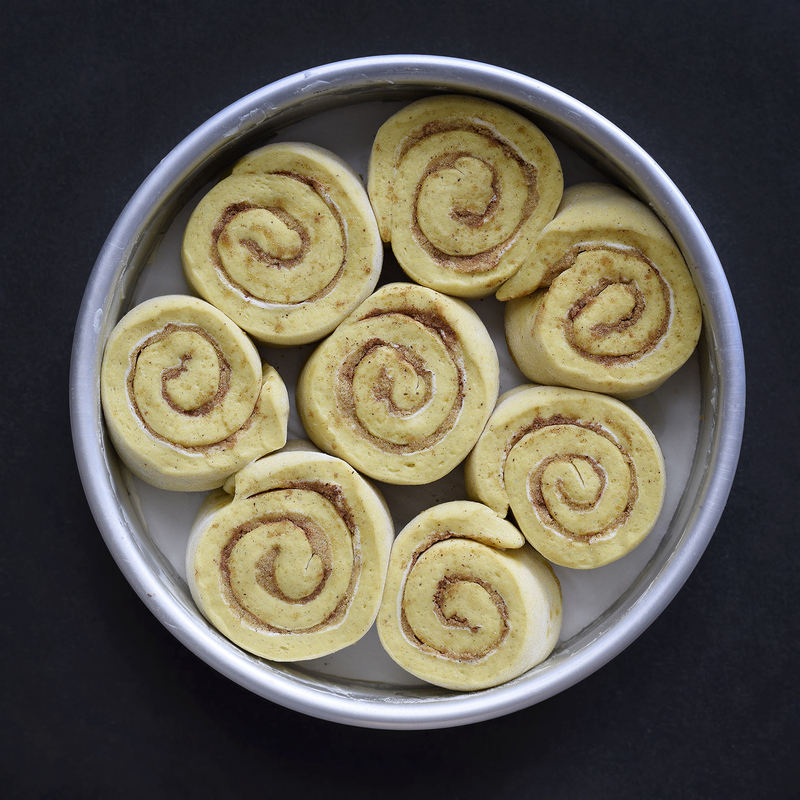 Take each of the four pieces of dough and cut those in the center too. 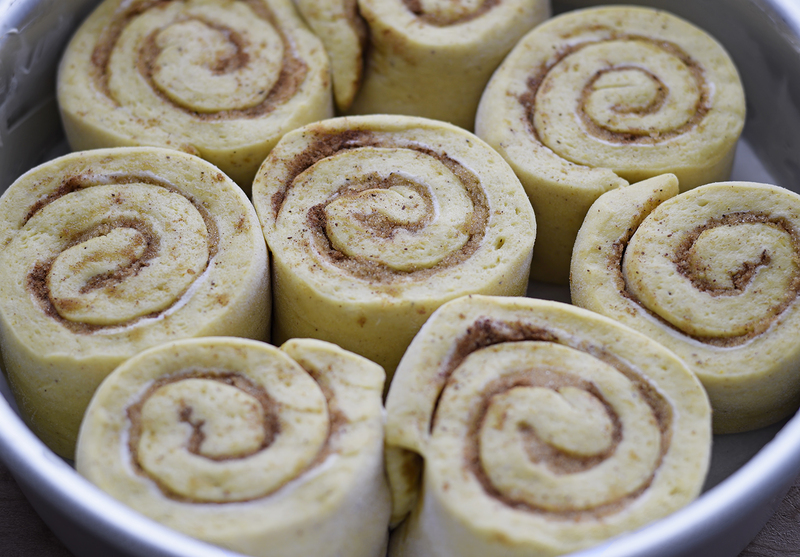 This gives you 8 cinnamon buns all of the same thickness. Even numbers are easy to portion, just keep cutting each piece in the center and you’ll have evenness. It’s easier to eyeball the center than two or three spots at one time! -Place the 8 buns face up in the cake pan, and arrange them so that they all have the same amount of breathing space, then squish them down lightly so that they touch each other and fill the entire pan. -Allow the buns to relax for a second time, giving them 30-45 minutes to rise in the pan. Again, I place the pan on top of my preheating oven to quicken the pace a bit. The buns don’t need to double in size during this rise, they just need to fluff up a bit and fill the larger gaps between buns. -Once the buns are fluffy to the touch and have filled the pan without gaps between each – give a quick brush of egg wash and place in the oven to crisp up! Baking times will vary, but bake until the tops are nice dark golden. It’ll take a while for the centers to bake through, so don’t be tempted to pull the buns out when the tops are light in color! -Once the buns are nice dark golden take them out of the oven and drop the pan on a cooling rack while you make the icing. -Allow the buns to cool for an additional 15 minutes or so, and then invert onto a cutting board or other portable surface so that the top is now the bottom and the bottom is now the top! The sugars and butter have collected and caramelized in the bottom of the pan during baking, making the bottom extra sticky and beautiful. Previous articleFoodSalty Pretzel Chocolate Chip Cookies. Cold morning. Pot of steaming hot coffee. 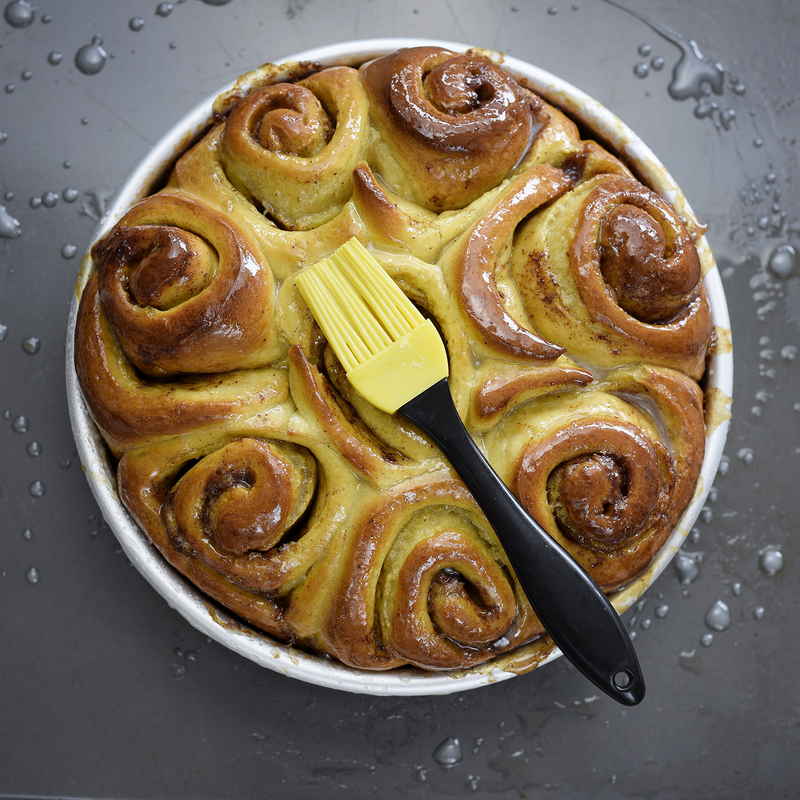 Your sticky buns. Sheer Heaven! I haven’t seen anything that looked that good in I don’t know how long! Thanks Michelle, that’s too kind! I use a Nikon D5300 SLR with a 50 mm 1.8 lens. That combined with a white umbrella, 28W 5200K daylight light bulb and a tripod! Thanks for commenting, hope you enjoy! i’m looking for a new camera so I will definitely keep this in mind 🙂 thanks! Good luck, would love to hear which gear you end up with!